Habit: Erect or leaning, branches 0, occasionally branched from tip-injury. Stem: (0)10--200(300) cm, 10--35 cm diam, depressed-spheric to short-columnar, hard, glabrous, not segmented; ribs 13--31, prominent; tubercles not conspicuous on ribs. Spines: 10--32 per areole, 2--4.5 mm wide, generally awl-shaped, generally flat, ringed with conspicuous ridges, straight to curved or +- hooked, some bristle-like; central spines generally 4 per areole. Flower: +- terminal, near distal edge of spine cluster, 3--6 cm diam; perianth yellow to red [or purple, or white with +- purple midstripes]; ovary glabrous, spines 0, scales numerous, generally rounded, margins minutely fringed or toothed. Fruit: spheric, ovoid, or cylindric, glabrous, spineless, dehiscent by basal pore. Seed: 1.5--3 mm, spheric to subreniform, pitted, black. Stem: taller than wide, spheric to columnar. Spines: 10--32, erect and spreading, longest generally recurved to +- hooked, hooked on immature plants, generally +- red [yellow], gray in age. Flower: inner perianth occasionally orange to red; style 12--20 mm, ovary 9--12 mm, scales fringed. Fruit: yellow. Seed: 1.5--3 mm. Chromosomes: 2n=22. Ecology: Gravelly, rocky, or sandy areas; Elevation: 60--1500 m. Bioregional Distribution: e PR, D (esp e DMoj, w DSon); Distribution Outside California: to southwestern Utah, Arizona, northern Mexico. Flowering Time: Apr--May Note: Formerly recognized varieties untenable. Threatened by collecting; monitoring needed. Synonyms: Echinocactus cylindraceus Engelm. ; Ferocactus cylindraceus var. lecontei (Engelm.) Bravo; Ferocactus cylindraceus var. cylindraceus; Ferocactus acanthodes (Lem.) Britton & Rose, nom. rej., misappl. Unabridged Note: The name Ferocactus acanthodes has been used for this sp. but its use is ambiguous because the type is lost and its identification is uncertain. 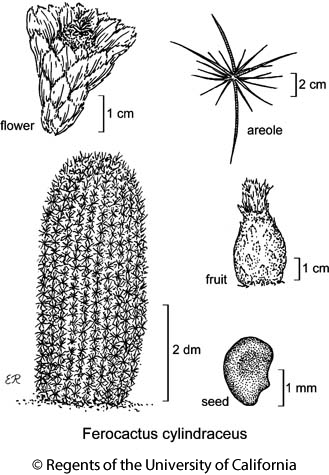 Citation for this treatment: Bruce D. Parfitt 2012, Ferocactus cylindraceus, in Jepson Flora Project (eds.) Jepson eFlora, http://ucjeps.berkeley.edu/eflora/eflora_display.php?tid=25765, accessed on April 19, 2019.
e PR, D (esp e DMoj, w DSon); Markers link to CCH specimen records. Yellow markers indicate records that may provide evidence for eFlora range revision or may have georeferencing or identification issues. Purple markers indicate specimens collected from a garden, greenhouse, or other non-wild location.